I posted this question lready but I think something happened to the text when I submitted it. I am trying to mix down my project in cuebase. The audio files mix down fine but the midi files wont mix down. I keep getting an error message. The tracks that wont mix down are VST tracks with EZ Drummer loaded into them. Why wont the EZ Drummer tracks mix down? When I started using Cubase I got the same error EVERY time I tried to mixdown, I just couldnt figure it out. I searched on google and it turned out many people had the same problem. You know those cursors you put like, on the each side of your project? Right and left. Those need to be on the correct spots. I had the right cursor on the left side and the left cursor on the right side. I dont know if this is the problem, I'm just throwing it in because me and many others have had this problem before. Yeah,explanation of message might help. If your audio tracks are exporting fine then location marks are ok.
Perhaps VST's output channels aren't pointed at your main output? It just said "An error has occured during the mixdown" or something. What Robin said earlier about making sure that the right marker is set correctly is right - it's a known issue with Cubase. Also with midi files in a song the common route is generally to record the midi track/s down to an audio track/s - render all your midi tracks to appropriate audio ones. Once you've done that then you can set the overall mix and then export as an audio file ready for a final stereo version. after export you need to import it again which might be irritating sometimes. I'm guessing that the issue here may lie in not recording the midi to an audio track before trying to save/export etc. Happens a lot. GrowingDown basically a midi track is information that the sequencer and vst read that tell them what note to play, when, at what velocity and so on. It doesn't however contain any audio. If you try to mixdown or export a midi track to a stereo (audio) mix it won't work as there is no audio. You get round this by recording the midi track on a second pass as an audio track. AFAIK, there is no requirement to render a track to audio before you mixdown, as long as you are using a VSTi to play the midi - I never used to do that (but I haven't used Cubase for 6 months and don't even have it installed now and can't check ...) - anyway, the key is that you are mixing down the master output track, not the individual tracks, should all work fine. If you set the markers (so you have a BLUE selection) there should be no problem at all. I have 5 different VST samples running through MIDI tracks and i never had to record MIDI as AUDIO. The usual MIXDOWN works perfectly. Here is a screenshot. You can see the markers, the MIDI track output set to Philharmonik and the export settings which can be set to whatever you want. Comes from me not having touched Cubase in a long time Andrew and Pavel . 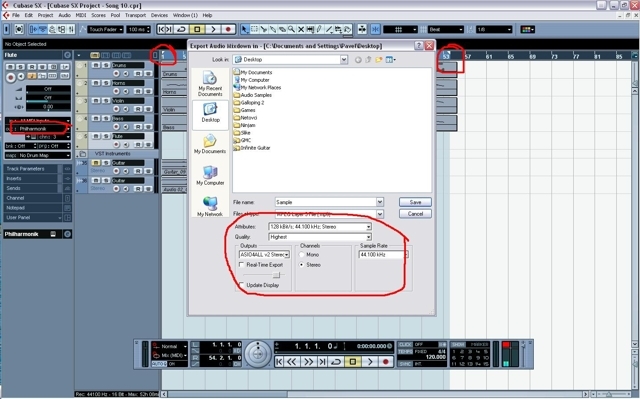 Looks like Cubase does the midi to audio render in mixdown automatically for you then provided that the left and right track markers are set properly . Yes, left and right markers are important for sure. Thanks guys so much for all the help. I am going to try working the problem using your suggestions. I will let everyone know how it goes. This site is awesome and you guys are awesome. THANKS!!! !